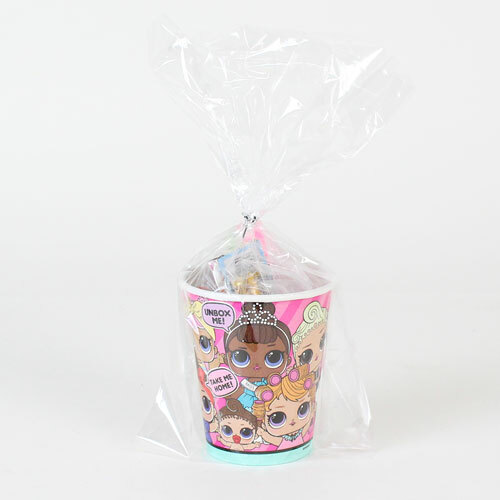 LOL Surprise Toy And Candy Cup Sold in a LOL Surprise paper cup filled with toys and sweets. Weight : 55gr approx Average content : 1 x eraser 1 x mini colouring pencils – pack of 4 1 x stretchy smiley yellow man 1 x mini pinball game 1 x fun gums sweets 4 x rainbow dust sweets INGREDIENTS: Rainbow Dust: Dextrose, Sugar, Acidity Regulator: Citric Acid, Artificial Flavourings. Fun Gums: Glucose Syrup, Sugar, Gelatine, Dextrose, Acid (citric acid), Flavouring, Fruit and Plant concentrates (apple, aronia, blackcurrant, carrot, elderberry, grape, hibiscus, kiwi, lemon, mango, orange, passion fruit, safflower,spirulina), Glazing Agents (beeswax, carnauba wax), Caramelised Sugar Syrup, Invert Sugar Syrup, Elderberry Extract.